STOCKHOLM, Sweden, September 5, 2013 (ENS) – President Obama is now in St. Petersburg, Russia at the G20 economic meeting, but he woke up this morning in Stockholm, where he agreed with Nordic leaders to cooperate on international climate negotiations and clean energy. This morning, President Obama met with the King Carl XVI Gustaf and Queen Silvia of Sweden before flying to St. Petersburg for the G-20 Summit. 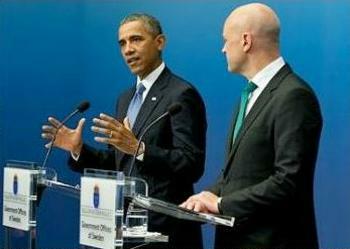 His visit was an historic event – the first bilateral visit by a President of the United States to Sweden. The six countries agreed to continue their work to reduce the use of domestic fossil fuel subsidies globally and work together to secure the support of other countries and multilateral development banks to adopt similar policies. In their Joint Statement the Nordic countries and United States recognized the positive reaction among nations to the 18-month-old Climate and Clean Air Coalition to Reduce Short-Lived Climate Pollutants. The main short lived climate pollutants are black carbon, methane and tropospheric ozone, which are the most important contributors to the human acceleration of the global greenhouse effect after CO2. These short-lived climate pollutants are also air pollutants, with harmful impacts on human health, agriculture and ecosystems. In Oslo, Norway on Tuesday, ministers of the environment, CEOs and senior officials of governments and nonprofit organizations released a communique laying out an ambitious agenda for the future in the fight to reduce short-lived climate pollutants. The communiqué emerged from the High Level Assembly of the Climate and Clean Air Coalition to Reduce Short-Lived Climate Pollutants, which met in an intensive day-long session of discussion and negotiation. The United States and Nordic countries expressed their support for the “Sustainable Energy for All” initiative of the UN Secretary-General. “We recommit to protecting the Arctic environment, working to improve living conditions and encouraging sustainable development in the Arctic region, particularly with respect to indigenous peoples, and ensuring that the Arctic remains a peaceful region of cooperation,” promised the six nations. In Stockholm, the United States also agreed to work in parallel with the Nordic members of the Friends of Fossil Fuel Subsidy Reform to undertake peer reviews of domestic fossil fuel subsidies. The Friends group was launched informally in June 2010 and currently includes Denmark, New Zealand, Norway, Sweden and Switzerland. In 2009 and again in 2010, G-20 and APEC Leaders signaled their political commitment to the reform of inefficient fossil-fuel subsidies, and set out their intentions in communiqués. Tucked away in the corners of the G-20 meeting hall, separate from the consuming debate on what to do about Syrian chemical weapons, the G-20 leaders may be talking about climate change and fossil fuel subsidies. Research suggests that reform of fossil-fuel subsidies could reduce global greenhouse emissions up to 10 percent by 2050 and make a substantial contribution to keeping global warming below two degrees Celsius in 2050. Reforms to fossil-fuel subsidies would remove an existing disincentive to the development and greater uptake of renewable sources of energy. Late Wednesday, President Obama and Prime Minister Reinfeldt visited the Royal Institute of Technology, where they saw the Sleipner hydrogen-powered car, named after Norse god Odin’s steed and developed at the Institute’s School of Chemical Science and Engineering.